Motherhood stress is rising and it is no wonder with all their responsibilities every day. Working mothers with young children feel stressed more than 90 percent of the time. But young children are not the only cause. Children of all ages can trigger stress at different times while growing up. Women need to change how they deal with stress as it has a serious effect on families over the long-term. So, how did mothers end up this way? No longer do many mothers have the support of extended family they did in the past. This is for many reasons but mostly because people move away from their families. While European and Asian cultures keep families close, this is not the Australian way. Australia’s history is built on convicts and early settlers who left families behind in their home countries. Our heritage is separation from family links. Mothers used to have family surrounding her when giving birth and her husband did not work long hours. All this has changed to where women often work up until a month before the baby is due. During this time, they have to cope with the stress of pregnancy, meeting the needs of other children, and forcing themselves to work when tired and under pressure. During pregnancy a woman needs to relax. Pregnancy should be a period of recovery from the physical effects of a developing baby inside of her. Today women don’t have the luxury to relax compared to pregnant women in the 1920s, 30s, 40s and 50s. Women’s brains are designed to take it easy while pregnant, not to work 38 or 40 hours a week and then meet the demands of the home. Supporting the family was the male’s role up until the 1970s and 80s. A woman’s brain has not adapted to working while pregnant in the 21st century. Conditions such as anxiety, fatigue, feeling overwhelmed, flat and exhausted can lead to their brains being in survival patterns of behaviour. Stress patterns caused by working, maintaining a pregnancy, a home, and the demands of your other children and a partner is massive strain on the brain. For the brain to recover, it needs 6 to 9 months after the birth of your baby. When you have massive stress and anxiety during pregnancy, your brain is under biological stress. You don’t have the time to recover when you return to work within 2 months of having a baby for financial reasons. You cannot change what is happening today and go back to the past. But in the old days extended family rallied around new mothers to support their transition into motherhood. They also helped them cope with the demands of their other children and of the home. Once your brain is in survival patterns of behaviour, it goes into a reality shock as your brain cannot survive and meet the demands of your baby’s arrival. This emotional state can trigger post-natal depression, fluctuating moods, and leave you feeling overwhelmed unable to cope.All of a sudden motherhood becomes a time of stress instead of joy. While motherhood stress begins with becoming a new parent, it improves. 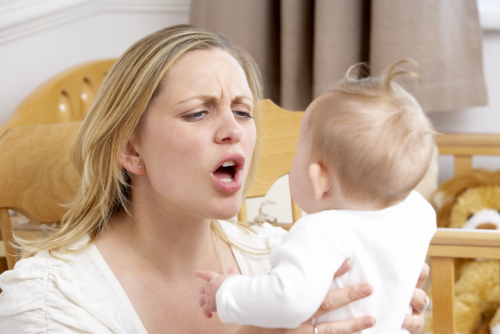 Children can trigger stress in their mothers at different ages all through their lives. Over the last decade, working with young mothers, I discovered a condition I call parental shock syndrome that greatly affects mothers and some fathers. Parental shock syndrome only happens if your brain was in a constant state of survival during pregnancy. Once that beautiful baby of yours is born, suddenly the demands on you significantly increase and paralyses your brain into a state of biological distress. If you do not relieve this acute stress, you live day to day in a constant state of emotional suffering. After the baby is born, it is important to get enough sleep so your brain can recover. It needs time to rebalance your hormones and emotions so you can cope with the demands of your new born baby as well as those of other family members. New mothers need constant sleep so they can enjoy motherhood. The challenge for you as a mother today is limited family support so you do not get the recovery time you need. If the father is financially stressed and the mother is stressed, both parents may not cope with the transition into parenthood. A lot of people are having their baby naturally so the transition to motherhood is easy. For many it is the opposite experience. They are so stressed and fatigued from lack of sleep, their brains cannot copy with caring for the baby and all their other responsibilities. You don’t know what sort of mother you are going to be until you have your first child as you have never been triggered by something you cannot walk away from. Children put you under constant stress at different times in their lives. Usually when stress triggers your brain, it responds to protect you. You can walk away. When work causes stress, you can go home. If driving down the freeway is stresses you out, you can take a different route. As a mother you can’t walk away from your child when it triggers you. A triggering brain is constantly under environmental stress. 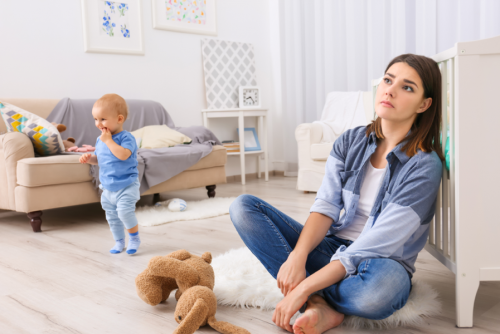 Being triggered by your baby or children is a sign your brain isn’t coping with motherhood, and is in a state of emotional and biological distress. Over time your brain goes into survival patterns of behaviour. I have an excellent audio program called Motherhood Stress which you can listen to every night to reduce your triggers. This helps you enjoy motherhood instead of it being a constant battle. Some mothers find going to work is more enjoyable when experiencing motherhood stress than staying home looking after their child. Do you ever feel like that? Children’s needs constantly change and you have to meet their needs. When suffering constant motherhood, financial and other stresses, there is a danger you become unavailable emotionally to your children and unable to meet their needs. When your brain is in survival patterns of behaviour, children can trigger you all the time. And motherhood becomes a constant battle instead of a time of joy and connection with your children. Most of my clients come to see me because of their childhood experiences. Mothers often say all they want to do is come home from work and lock themselves in their room. But they can’t because they have children who need them. When a mother feels this way, she is not emotionally available to her child at that time. She is struggling to survive her own life. She cannot nurture, love and grow her child. All she can do is meet her child’s basic needs. There is nothing left to give and emotionally her cup is empty. If you have to work to support your family you can’t change that but you can change how your brain responds to stress. When the baby’s heart first starts to beat that is the spirit entering the baby. The spirit is integrated into your heart and connected to your nervous system. And the nervous system becomes the heart of the brain so your child becomes spiritually connected to your reality. This is where a mother’s intuition comes from. When the mother is stressed, the children are stressed. When the mother is calm, the children are calm. So, if you are not emotionally available to your child it can create patterns of abandonment. You may come home nursing a headache, and one sharp word or pushing your child away in that moment is enough to create feelings of rejection. Your child may feel its needs were not met because you were not available. The secret to enjoying your children is reducing motherhood stress. Here are nine real life tips to help you take action to break this cycle. It is hard to cope when you are tired so get more sleep. But when? A cranky, irritable mother who yells all the time is no good to anyone. You probably feel guilty when you fly off the handle so this adds to your stress. When you feel tired at night go to bed instead of trying to finish the housework or watching television. Even commit to going to bed an hour earlier than usual a couple of times a week. Try taking a nap when your child naps or catch up on sleep on the weekend. You need to make a conscious effort to get the sleep you need. Spend time practicing mindfulness meditation. It helps you focus the mind on the present moment. This reduces stress and decreases your emotional reactivity. Mindful meditation can even help you get a better night’s sleep. Set aside some time each day, even if it is only 10 minutes to boost your coping skills. Check out my mindfulness mediation exercises. They can work to make you feel relaxed. Make daily meditation a new habit. Focus on feeling gratitude for all you have in your life. This helps you deal with stress. Everyday focus on something you feel grateful for. While it is easy to feel overwhelmed and guilty as a mother, it is just as easy to find moments to be grateful for each day with your children. Be thankful when they tell you they love you for no reason and come running to give you a hug. Celebrate their milestones and the joy they bring into your life. It is hard to feel anything but good when you are grateful. 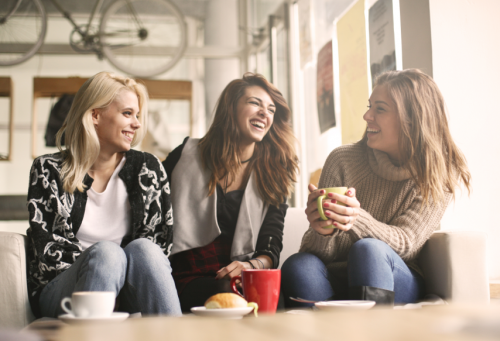 While you may think you have no free time from the time you wake up to the time you fall into bed, it is important to make time to spend with friends. Organise a lunch or a night out with your friends. You need to stay connected. Even organise a meet up with other mothers. Enjoy a coffee and a chat while your children play together. You need to socialise for better life balance. Spend time enjoying the outdoors. Too often we go from the house to work and back again without even noticing the beauty of our natural world. When you feel stress build up, go for a walk. Go to the park or the beach. Take the children with you for a picnic or collect shells from the shore. It is not good to always stay cooped inside. Fresh air and nature reduce pent up tension, and enhances your wellbeing. Be generous with your hugs. When you feel stressed and out of control, a hug can make you feel so much better. Hugs soothe your soul, and make you feel warm and loved inside. Next time you feel stressed give someone a hug. It is a fantastic way to release stress and feel better. I guess you think you do not have the time to exercise. Exercising regularly puts your body under stress but clears your mind. And you will feel great afterwards as well as get fit. Being too busy is not a good excuse to avoid physical activity and neither is blaming your children. Take them with you for a walk or a hike. You can even take your baby in a pram or a body sling. It stimulates your endorphins and makes you feel good. This is a great way to set a good example for your family. Schedule regular dates with your partner. It is important to spend quality time together. Date nights do not have to cost a lot of money. Share a picnic in the park, go for a walk or watch a movie together cuddled up on the couch. Just make sure you spend some quality time together at last once a week. When was the last time you had a good laugh? Laugh, smile and giggle your stress away. Laughing is healing. This gets rid of all your tension. Bring some fun back into your life. Do fun, silly things with the kids to make everyone laugh. 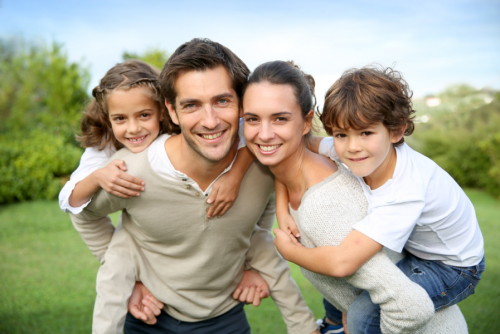 It wards off stress and creates memories of the fun times you have together as a family. If you don’t want to spend months or years changing your stress patterns, I can help change these in weeks and not years. My Emotional Empowerment Program can help you thrive not just survive. Contact us to find out how I can help you get rid of motherhood stress. It does not matter where you are in the world. We can work with you in our Spas, over the phone or via Skype. Book in today for my Emotional Empowerment Program. 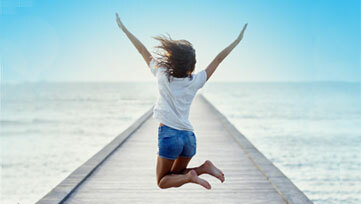 I have an introductory offer for just $79 so you can start your journey towards a stress-free life. 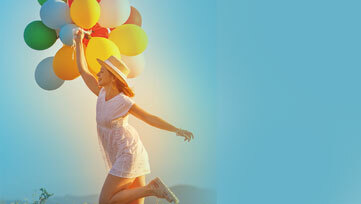 We can help you to replace stress with joy, happiness and love.